[EDIT]3.14.6 is bugged and should have been called 3.15, read more and get the fixed D/L. Well boys and girls, oh, and you ladies and gentlemen in the modded Minecraft community, we are back in business, and finally despite the perfectionists and various troublesome bits of code have a new release for you all to tinker around in. For those of you who could care less about any news and just want the download link, go have at it. Although you might want to read the change list as there were a couple things that you may want to know if you run into any issues, and a few things have changed. For those of you who are willing to wait a little while, please continue reading. We have a top secret project that we had hoped to preview/demo in this build, but things haven’t worked out quite as well as we had hoped, so we had to push it back a little longer. No, this secret project is not v4, although it has helped me breakthrough some of the things that had been holding me back. I really can’t say to much more with out giving away to many things. But to sum it up, it is something that as far as we know, has never been done before and when the entire project is complete it might even blow one or two people’s minds. Anyway, we’ve got a number of things lined up and with more team members, we think we can knock them out. I must say that it has been fun working back and forth on our secret project, with Allaryin and myself pushing code back and forth, and extending each other’s ideas when one of us hits a road block. On to what is new/changed in this release. We should have better support for Thaumcraft 4 (Finally), and some of our old quarter logs have finally been replaced with more user friendly versions that are a little more inter mod friendly. The old ones are still in but they are only able to be crafted into the new version and will no longer be generated, and only exist so that people don’t suddenly have trees that are missing their trunks. There was a bunch of code cleanup, and a few minor things managed to slip through the cracks that were not discovered till after we had our release candidate and we had already delayed releasing longer than intended so since they didn’t break anything we decided to let them go for the moment. I may do a build on Monday to just fix the few things that I discovered at the last moment. Configuration file has been moved out of it’s own directory, there is no real reason to have a directory with just one file in it. Also the config file also keeps a version number in it now, so that in the future if we change the defaults for any settings, or add a new setting for some thing that previously did not have a setting, we can set the setting so that if you upgrade it will default to the old behavior and not break any world, and if you want the new behavior you can turn it on. We let Minecraft automatically load our localization files now instead of having our own loader. We discovered a small issue with this with not being able to localize one of the other new features that we added, but it is not all that major. The new quarter logs now place in what I feel is a logical pattern, and as such you can now easily build things like large bridges supported by multiple quarter logs side by side without needing to use the log turner for every single log that you place. Sakura Blossom Tree has been renamed to just Sakura Tree. Silk Touch on an axe finally has a use now! As part of an effort to make the quarter logs a little more inter mod friendly, when you chop down quarter log or an elbow log you will get the normal log equivalent, unless you use a Silk Touch. Elbow and quarter logs can now be crafted/uncrafted, if a log has a quarter log equivalent just place four logs in a 2×2 square and you will get four quarter logs, and three logs can be placed in a sort of an upper case L to get three elbow logs. Support for New Dawn, another mod that allows for generation of a different style of terrain. 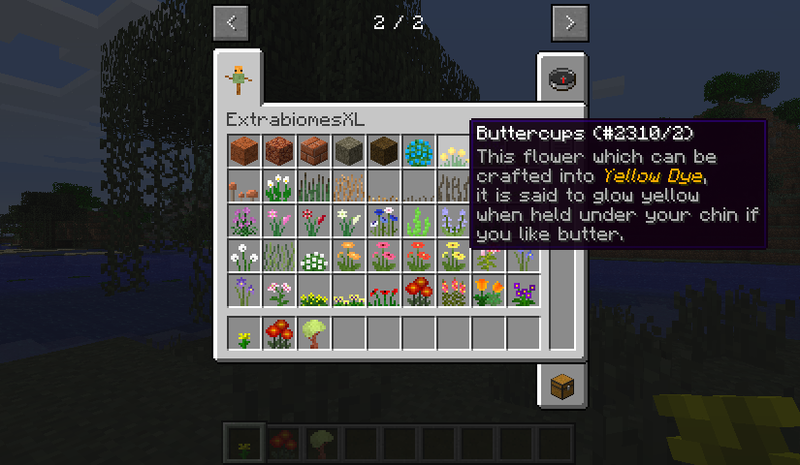 Thaumcraft 4 support for almost all our items, some of our new flowers were last minute changes and got passed over when it came to giving them Thaumcraft 4 aspects. They will have their proper aspects come next update. We changed up flowers a bit, the Root and Autumn Shrub have been removed. They still exist but will no longer generate or show up in creative. We also added 28 new flowers. Spawning for the flowers has been reworked and we are still doing some tweaking on that. Helpful tooltips are now available in English for some things. Things like what patterns saplings will grow into trees from, to help you know why that single redwood sapling that you planted won’t grow into a mighty tree. This should help out with future trees as we start to incorporate some of the Forgotten Nature and More Than Just Trees stuff. 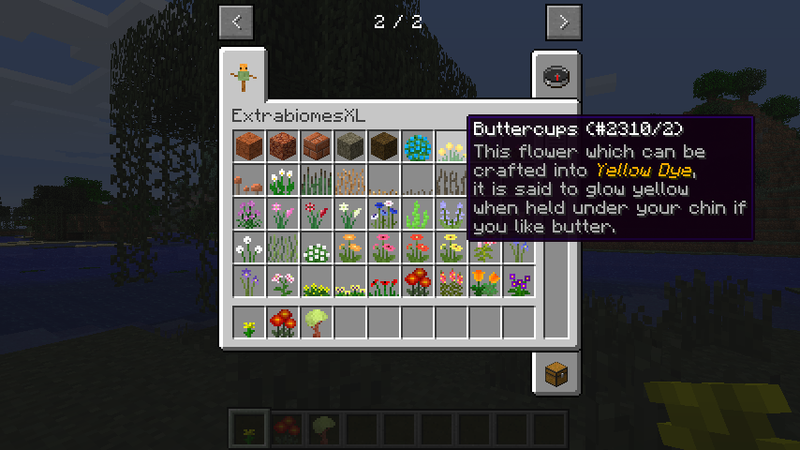 Other things like the flowers have some flavor text about to them, though we are by no means done with the flowers. Oh and if you ever wondered if the scarecrow had a use, well you can now see it in it’s tooltip. As it stands we need to do more research to enable localization of the tooltips, as it appears that it may not be possible in 1.6 without some of our own localization code. Well I know there have been a few I just can’t think of them off the top of my head, and it is getting somewhat late.